Make Power-over-Ethernet-capable Gigabit network connections. 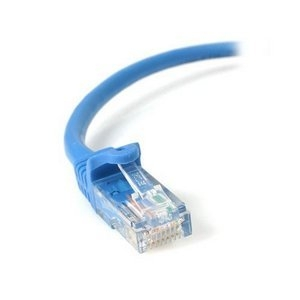 The N6PATCH3BL Cat 6 Patch Cable (3 ft) meets or exceeds all Category 6 cable specifications to ensure reliable Gigabit network connections, and features a durable blue PVC jacket that enables you to color code your network cable runs as needed. Constructed of only top quality materials, this Cat 6 Patch Cord delivers reliable performance and is backed by our Lifetime Warranty. StarTech.com Cat6 cables are manufactured using high-quality copper conductors. While many cable manufacturers offer a "cheaper" cable based on a copper-coated aluminum core, we make no compromises on quality to ensure you receive top value and performance for your network cable investment.